I cringe whenever I hear our ministers and politicians talk about making our country the centre of educational excellence. Our varsities have consistently fared poorly in the World Universities Ranking (WUR). University Malaya, our premier institute of higher learning, has dropped to 207th in the 2010 WUR, UPM to 319th, UTM 320th and UKM 309th. Yet with those kind of rankings, our Deputy Minister of Higher Education assures us that our public universities can produce a Nobel Prize winner. He certainly has big dreams. Much has to be done before that can happen. The entire education system is in dire need of a massive overhaul. For a start policy-makers in the Ministry of Education should watch this video and learn from it. So should all of us, if we are truly concerned about our children and grandchildren's education. What Sir Ken Robinson says here makes a lot of sense. I highly recommend the video for viewing. The just-released Transparency International's Corruption Perceptions Index (CPI) couldn't have come at a worse time for the government. Only two days ago at the launch of the ETP, the PM was sprouting impressive numbers to draw investor confidence in the ETP. Foreign investors study CPI rankings before they decide whether to invest in a country. With a ranking of 56th out of 178 countries surveyed, it explains why Malaysia's Foreign Direct Investment (FDI) has fallen from a high of RM46.6 billion in 2008 to RM22.1 billion in 2009. It also explains why the PM is counting on Domestic Direct Investment rather than FDI as the key driver of the ETP. The government should get its priorities right. No need to spend millions on glossy promotional materials and paying international marketing consultancies. Also no need to waste taxpayers' money on lawatan sambil belajar (overseas study trips). Just take a short trip down to Singapore. Find out what it has been doing right to top the CPI rankings. If the government is serious about fighting corruption, start with the public service. The recently released Auditor-General's Report offers more than enough evidence of all kinds of hanky-panky, graft and mismanagement of funds in the public sector. A few weeks ago my niece was stopped at KLIA immigration checkpoint. 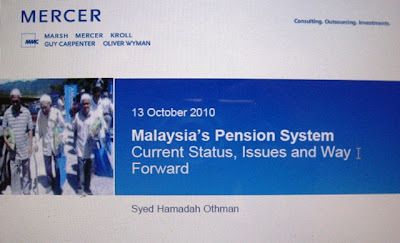 She was told she was on PTPTN's black-list of loan defaulters. According to the officers, she had taken a loan to cover tuition fees for her studies at University of Malaya. 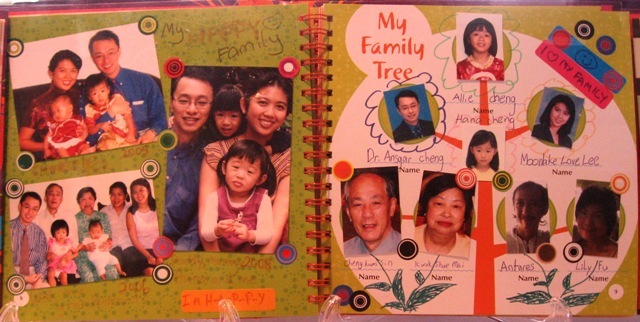 Now get this - she never applied for any loan, and she graduated from the National University of Singapore years ago. She asked for proof of the loan application and approval. She was told they couldn't trace the documents. My question is where did the loan money go? Why is there no accountability for this misappropriation of public funds? I doubt I'll find an answer. I was at the launch of the government's "Economic Transformation Programme: A Road Map for Malaysia" at PWTC this afternoon. 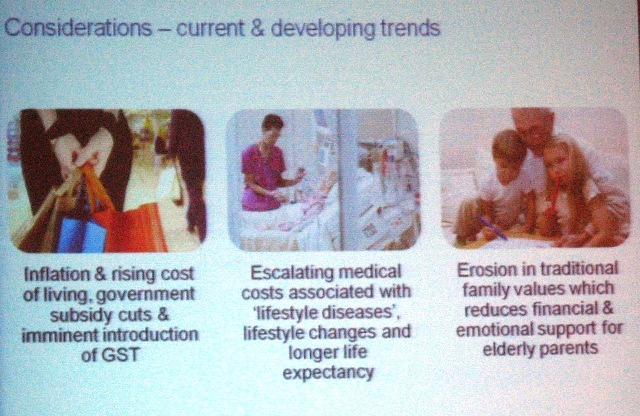 Listening to the PM's presentation and viewing the ETP video gave me a bad case of indigestion. Those astronomical numbers that he was throwing out were churning my stomach. Even when I tried to take them in with a pinch of salt, the numbers were still hard to swallow. The PM was on a roll as he spoke of turning Malaysia into a high-income economy with a GNI of over RM1.7 TRILLION in 2020. 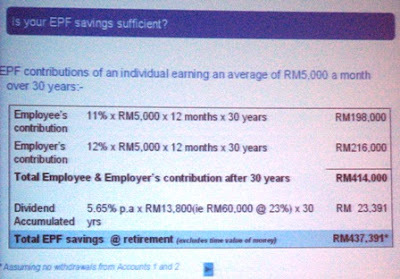 That translates into a GNI per capita of RM48,000, up from RM23,700 in 2009. "The ETP is not a plan," he emphasized. "It's a programme with projects already onstream", and to prove it, he listed nine private companies both local and international that have committed RM30billion under the ETP, among them Genting, Malaysia Airports, St Regis, Mydin and Germany's LFoundry. 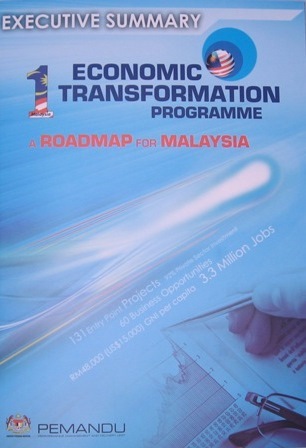 Note that the 3.3 million jobs that the ETP hopes to create by 2020 will be mainly for middle and high income earners. What about the poor? 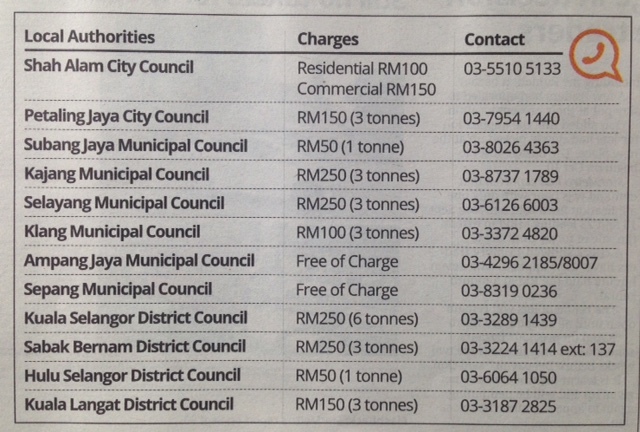 How will the ETP generate income for them? Numbers scare me especially when they have a string of '0's attached at the end. The PM is counting on massive investments in the economy with Domestic Direct Investments (DDI) leading the way. Will the private sector have enough faith in the ETP to jump on board? I've always considered myself an eternal optimist, but I can't help feeling that all this is aimed at winning over the rakyat's votes in the next election. If the rakyat buys into the ETP, the BN government is assured of remaining in power at least till 2020. 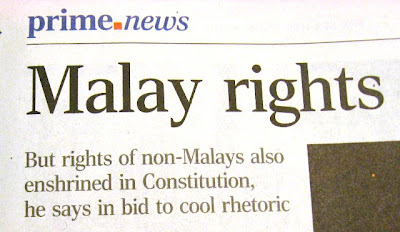 The media in Malaysia and Singapore must start using the correct terminology when translating from Malay to English. Article 153 of the Constitution refers to 'the special POSITION' of the Malays, and not 'special rights'. I almost choked when I read these words in The Straits Times (22 Oct) report on Najib's keynote speech at the UMNO general assembly yesterday: "UMNO will defend Putrajaya even if bones and bodies are crushed, and lives are lost". What kind of leader makes an open threat like that? 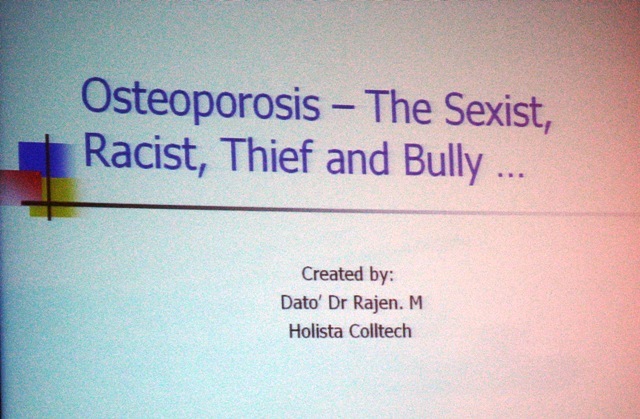 Whose 'bones, bodies and lives' is he referring to? Does it mean UMNO will act unilaterally? Will the other BN component parties play dumb, deaf and blind? This is what happens when we have race-based political parties. It's the people who decide who takes charge in Putrajaya. If BN is voted out in the next elections, is Najib going to make good his words? I shudder to think of what this would mean for the country and the people. One thing I know for sure, the PM has sealed the fate of UMNO, and BN. His threat will galvanize even more support for the opposition. 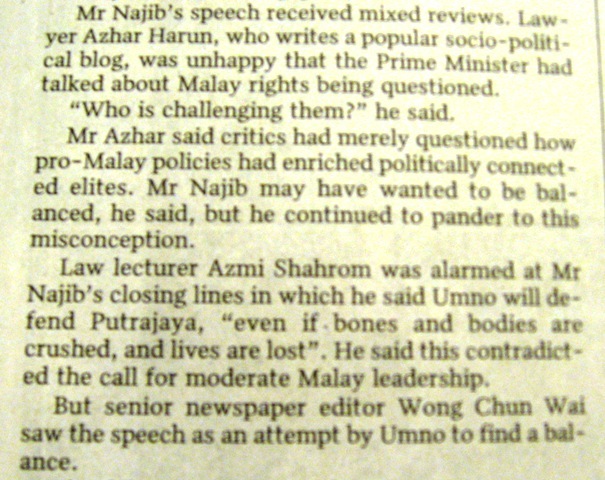 The last nail has been driven into UMNO/BN's coffin. ﻿Under the proposed changes to the Maintenance of Parents Act (Singapore), adult children may not be legally obliged to support their aged parents if they are undeserving of the support. One of the proposals is compulsory mediation between the two parties to resolve any grievances they have before taking the matter up to the Tribunal. Children who grow up never knowing what it is like to be loved and cared for by their parents cannot be expected to show love when there is none. 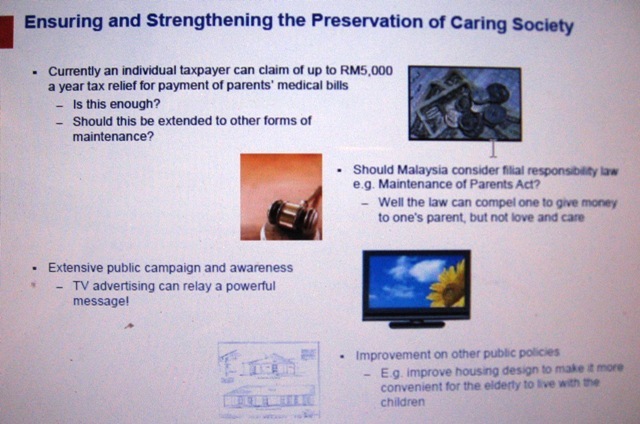 If compelled by law to provide financial assistance to their aged parents, they will do so but with resentment. A case of '﻿as you sow, so shall you reap'? Or is 'blood thicker than water'? 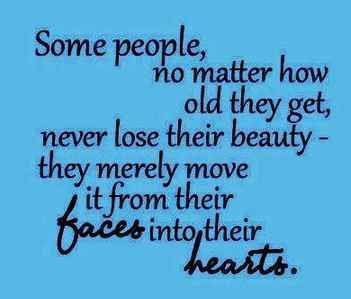 Will the children find it in their hearts to forgive their ageing parents, especially now that they are frail and ill? Retirement planning encompasses much more than just ensuring we have enough set aside to sustain our retirement. 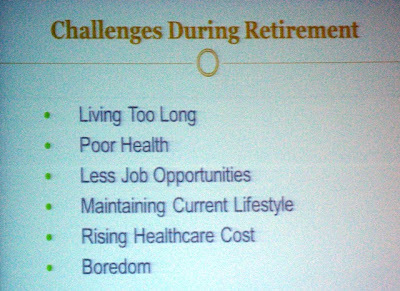 But for retirees and soon-to-be retirees, it is the bread-and-butter issues that concern us most. 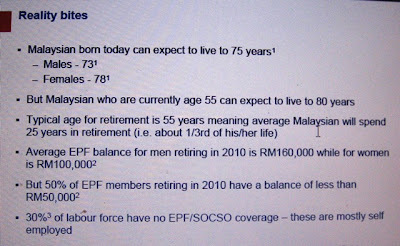 Given the longer life span of 75 and early retirement age of 55 (private sector) and 58 (public sector), will our retirement savings run out before we do? 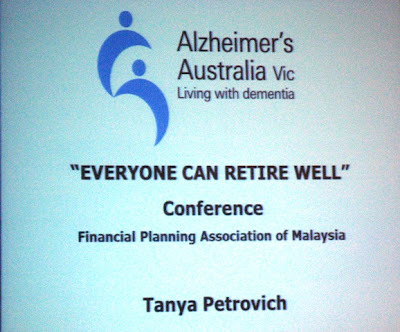 At the recently concluded "Everyone Can Retire Well" conference organized by FPAM, industry experts were on hand to share their views and offer suggestions to conference delegates comprising financial planning practitioners, policy-makers, financial services and product providers, academics and NGOs. 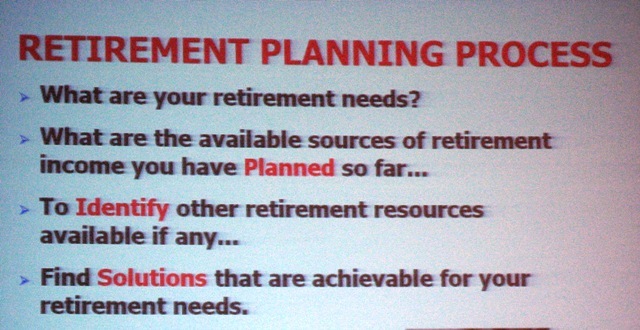 Above: Questions we should all ask ourselves when planning our retirement. 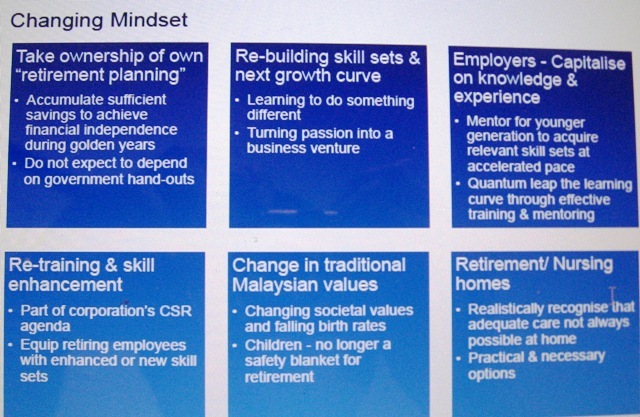 An excellent guide to help us through the process, presented by ReMark's Senior Client Director K. Sasitharan. 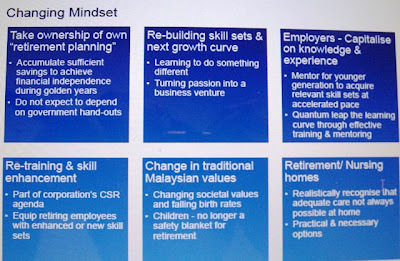 Above: An in-depth presentation from Syed Hamadah Othman, senior consultant with Mercer Zainal Consulting. Very well researched, with plenty of food for thought. 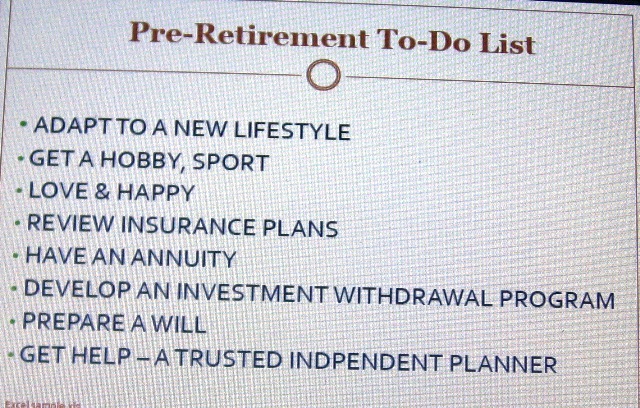 Nothing like a wake-up call to set our retirement planning wheel in motion. 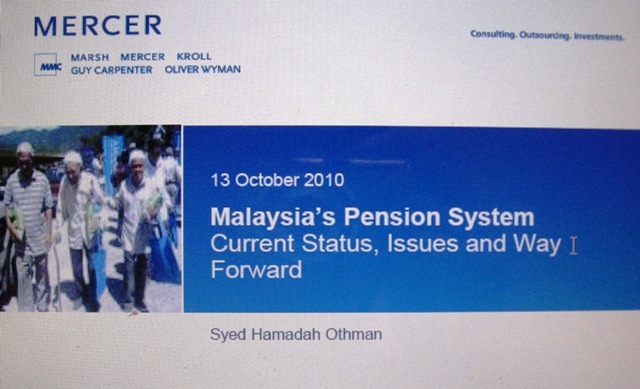 To find out more about the multi-pillar pension scheme, click here. Highly recommended viewing. Above: Pricewaterhouse Coopers Senior Executive Director Khoo Chuan Keat shared his wealth of knowledge on Malaysia's tax system, and updated participants on current exemptions and reliefs. 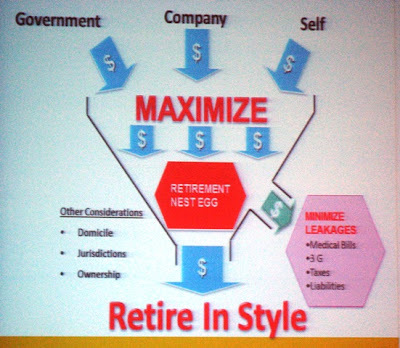 Check out his proposals on how the government can create a more conducive tax environment for sustainable retirement. Definitely the way forward. Let's hope policy-makers take note. 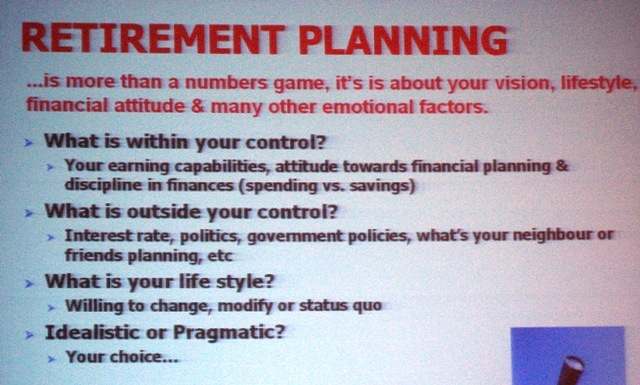 Above: Anthony Boon of IPP Financial Advisers, Singapore, spoke on how to manage the retirement planning market. Semi-retired at 42 after making his fortune in the industry, his words certainly carried credibility with many of the participants. After the first panel discussion. 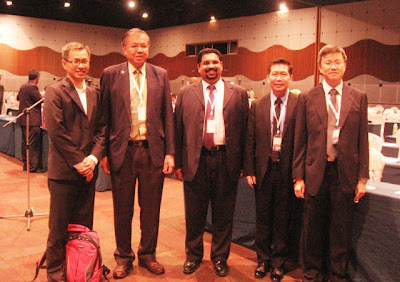 From left: MP Tony Pua, Tan Kim Book, K. Sasitharan, co-organising chairman Tan Beng Wah, and Teh Loo Hai, consultant with LIAM. There were two panel discussions. 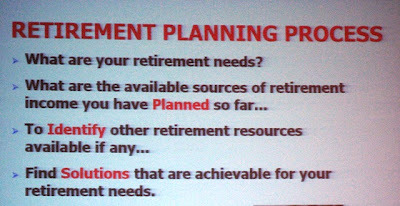 The first one "Is there a need for national health insurance for retirees?" was lively with participants giving the panelists a tough time with their questions on implementation and transparency issues. If the second panel discussion was meant to be a summing up of the conference, it did not quite succeed. 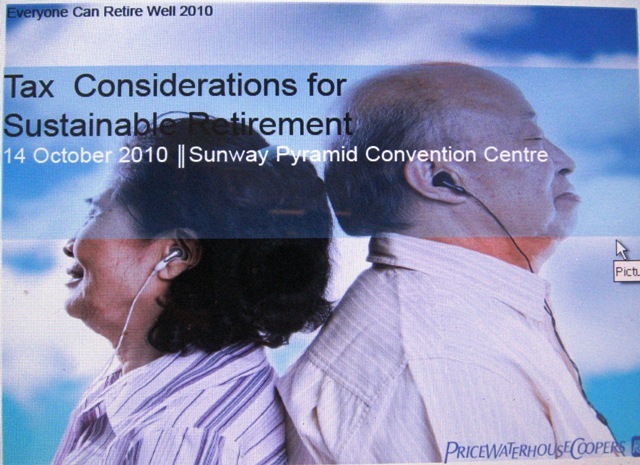 As stated in the panel notes, there are at least six dimensions to retiring well. The panelists - UM Prof of Psychology Dr Low Wah Yun, UPM Institute of Gerontology Asso Prof Dr Tengku Aizan, author and CEO of RD Wealth Creation Rajen Devadason and CEO of CIMB Islamic Bank Badlisyah Abdul Ghani spoke on their respective areas of expertise. Missing were experts on the dimensions of spiritual, social, occupational and intellectual well-being. Coming at the end of the final day of the conference, it was not surprising that the second panel discussion attracted only about 150 partcipants. 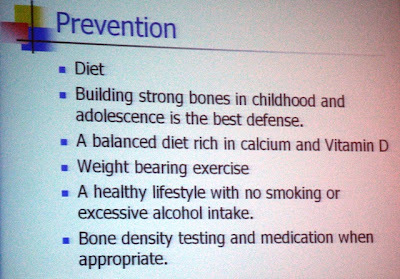 Did the 2-day conference meet the following objectives? The answer is Yes to all the above. However, there is always room for improvement should the organizers decide to make the conference an annual event. For a start, images used for the conference and for marketing purposes should be multi-generational. This would effectively send home the message that retirement conferences are meant for all age groups, not only retirees and pensioners. 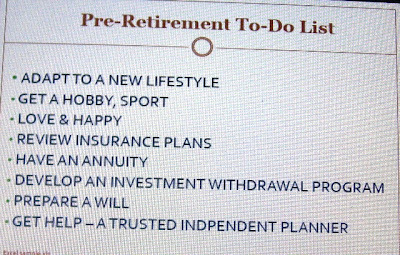 After all, the point to be made is that everyone CAN retire well provided they start planning early. 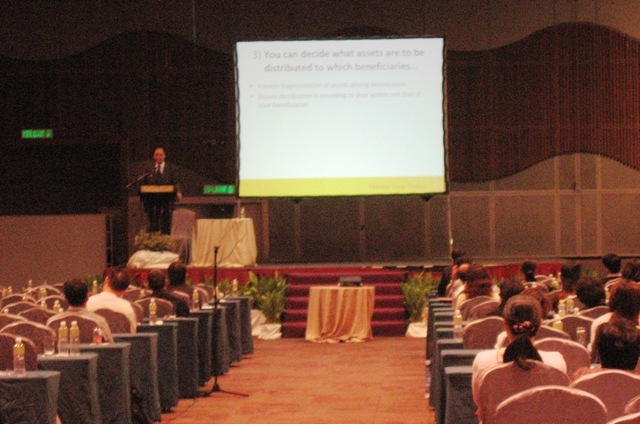 A free public talk on "Why Everyone Needs a Will" by Azhar Iskandar Hew, GM of Rockwills Trustee Bhd. Having free public talks to run concurrently with paid-for talks may give the wrong impression that the former are conducted by industry juniors and may not be worth attending. Which is most unfortunate as it is not the case at all. In fact the feedback I got from those who attended the talks was positive, with many saying they had learned a lot from the talks on will-writing, credit card management, real estate and investing. The organizers might also want to consider offering special rates for senior citizens and full-time students from institutes of higher education. If the primary aim is to educate, then it makes sense to reach out to as many demographic groups as possible. 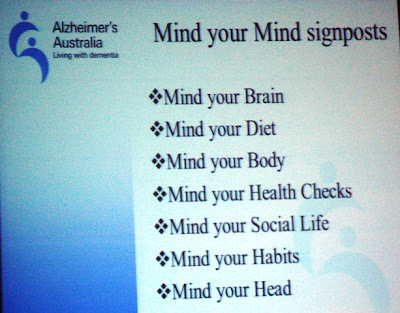 Changing mindset is the biggest challenge for any organizers of events aimed at raising awareness. It remains to be seen whether FPAM has succeeded on this score. 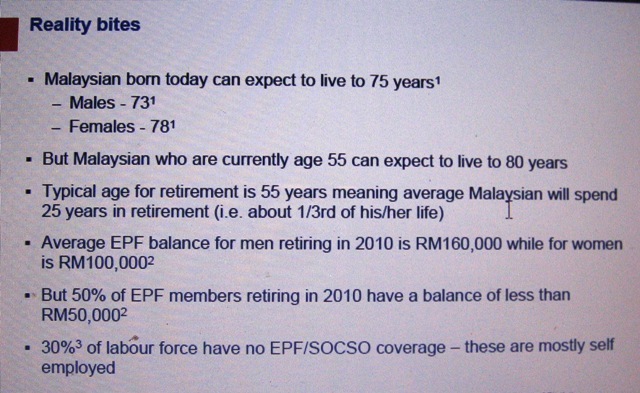 Given that 9.5% of Malaysians will be above age 60 by 2020, the recent conference "Everyone Can Retire Well" couldn't have been more timely. 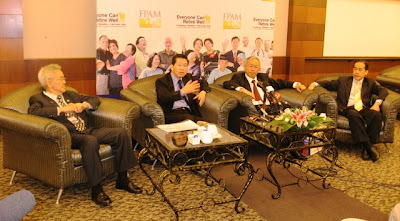 Organized by the Financial Planning Association of Malaysia (FPAM), the event also included an exhibition and free talks for the public. A good turnout of participants from the government and corporate sectors, financial institutions, universities, real estate developers and the medical fraternity. According to conference co-organising chairman and FPAM deputy president, Tan Beng Wah, there is currently no single umbrella body to coordinate the activities of all the different stakeholders in the retirement planning industry. The conference would provide a common platform for them to get together and discuss best policies to be implemented for the benefit of everyone. The organizers also felt there was an urgent need to raise public awareness of the challenges that lie ahead not just for the country, but for the individual as well. To this end, a separate programme of free talks by established local and international experts was held in an adjoining hall. Although the talks were promoted in the print and e-media, the turn-out was small. A real pity as there was much to learn from the experts. 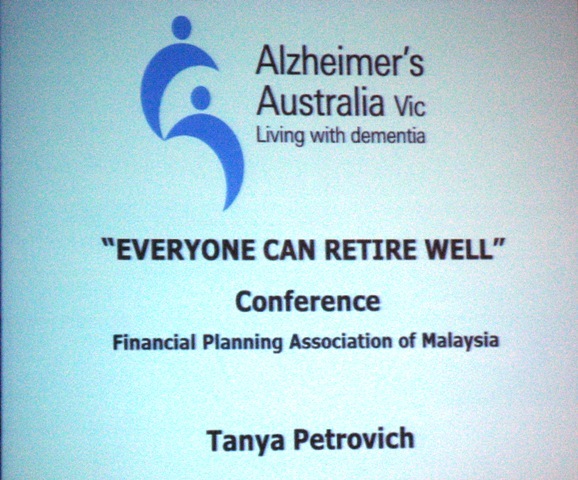 Topics were wide-ranging, from investment opportunities to estate planning and retirement villages, to name a few. One of several booths at the exhibition. This one offered free health checks. The following screen shots are solely for educational purposes. 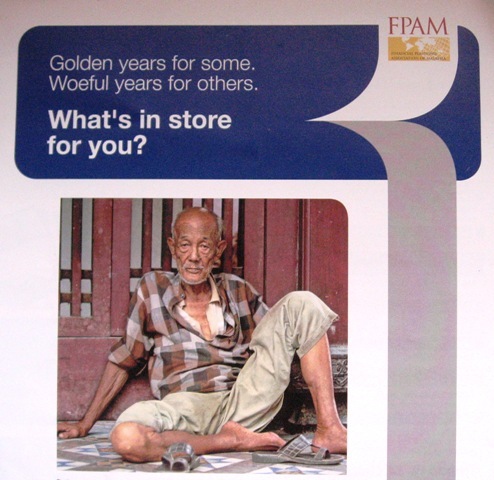 Please visit the FPAM website for more infomation on the talks and the speakers. 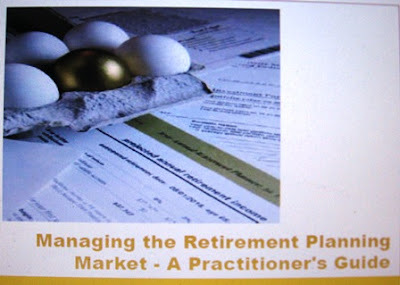 Medical planning is an integral component of retirement planning. We tend to focus on financial planning, and forget that without good health, retirement can literally be much more than a pain in the neck. Of what good is knowledge if we don't act upon it? If any of these health issues or medical ailments apply to you, seek expert advice. The price to pay for ignorance or indifference. 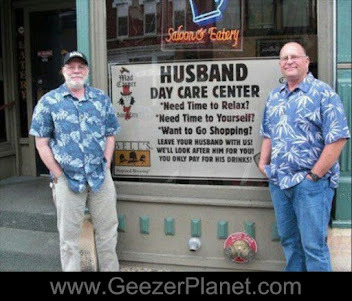 Time for me to make an appointment. What about you? Also speaking on the aspect of health concerns for retirement planning was Dato Dr Rajen, an authority in the field of alternative and traditional medicine. In his presentation he referred to osteoporosis as a thief as it steals the calcium from our bones, a racist as it favours Chinese and a bully as it picks on women who are smaller in frame than men. 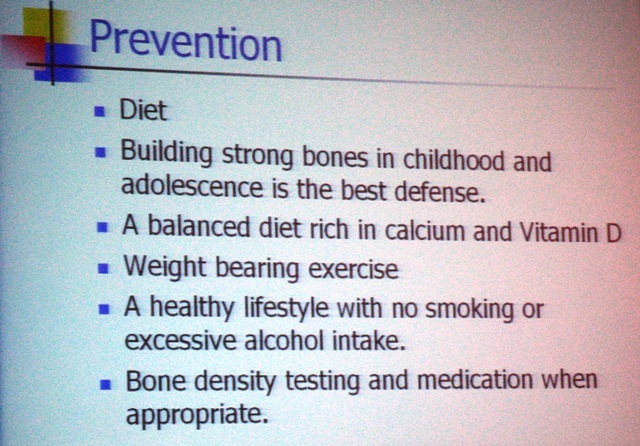 His advice for strong bones - get at least 20 minutes of exposure to sunlight in the mornings or evenings. 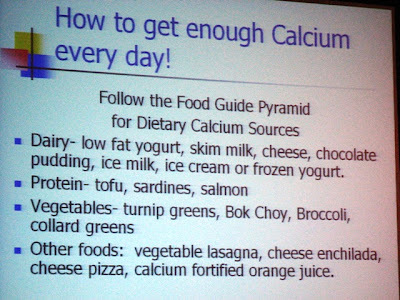 This is essential for our body's production of Vitamin D and calcium. If you are lactose-intolerant, take yoghurt or soy-based food products like tofu. 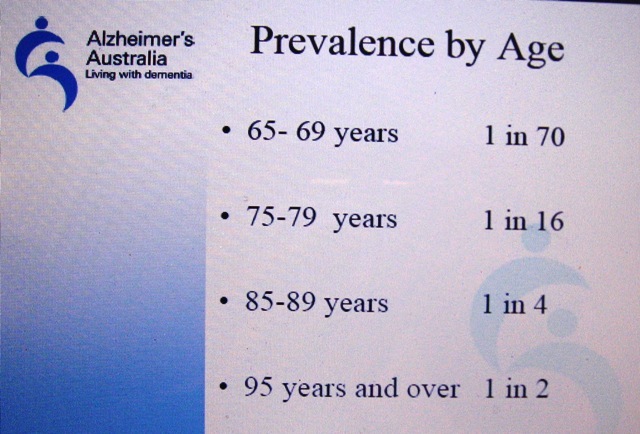 Next up was Dr Tanya Petrovich's talk on Alzheimer's Disease. 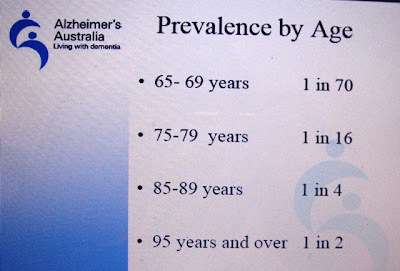 The statistics are alarming. 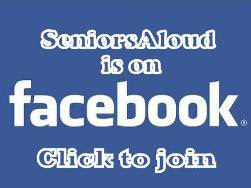 There are brain exercises like Suduko, mahjong, crossword puzzles that can help keep the mind agile as we age. 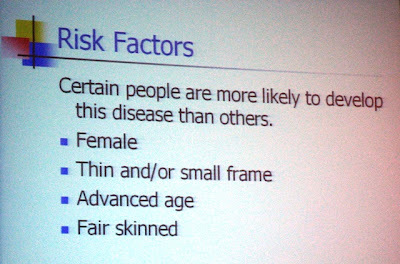 Like muscles, if we don't use our brain cells, we 'lose' them. It's a relief to know that being forgetful is not necessarily a symptom of AD. 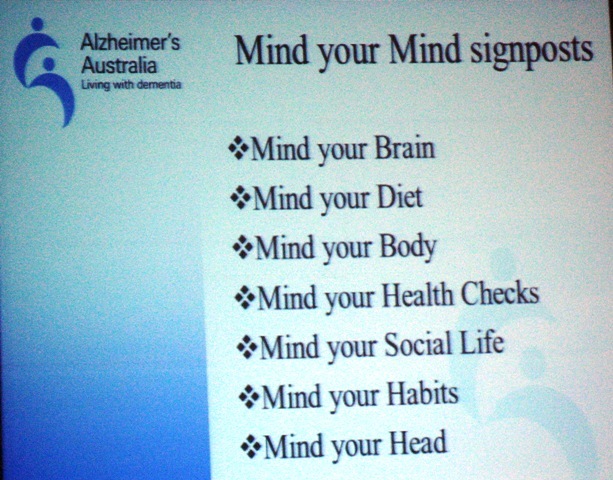 Alzheimer's Australia has come up with the Mind Your Mind booklet which you can click here to download for free. 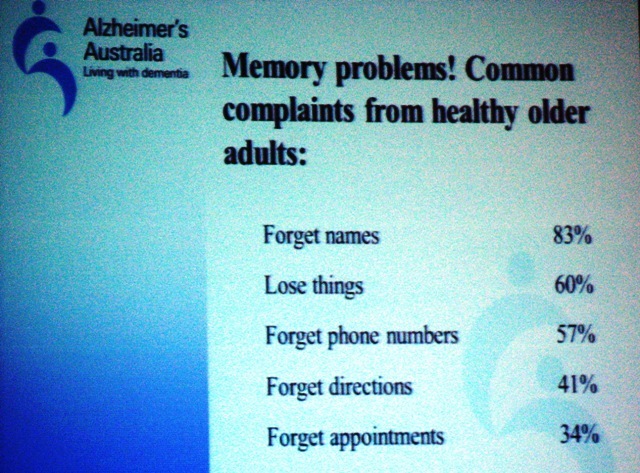 It gives tips on how to minimize the risk of getting dementia and AD. 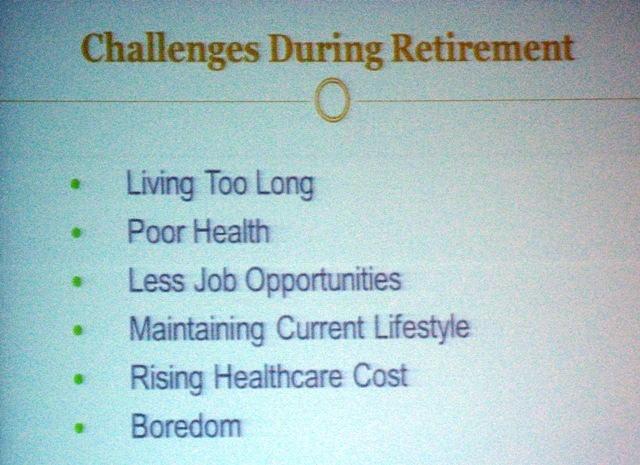 CAN WE AFFORD TO RETIRE? MALAYSIAN CITIZENSHIP - WHY THE LONG DELAY? THE CIVIL SERVICE - THE NEW UNTOUCHABLES? FROM BRAIN DRAIN TO BRAIN GAIN? NAH!